They see: polished, put-together and professional. You feel: comfortable, cozy and clever. Structured but also secretly stretchy, our new Charles Blazer is like a sartorial magic trick. Made in NYC. Will ship in 6-7 weeks. Relaxed fit at shoulder and through the sleeve with an intentionally loose fit through body. 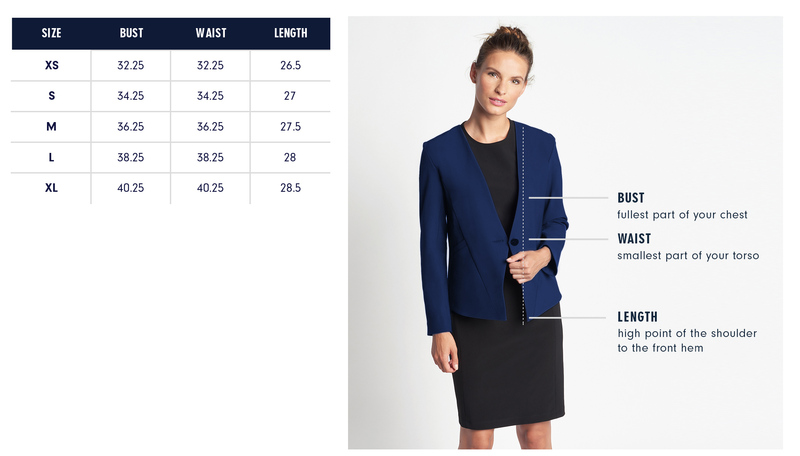 Our model Damaris is 5’10.5” and wearing a size S.
Below are the exact measurements of the Charles Blazer. All measurements are in inches. For general brand fit, sizing, and measurements, please visit our Brand Fit & Size Guide. Care: Machine wash cold; line dry; iron low. Do not tumble dry or bleach. Relaxed fit at shoulder and through the sleeve with an intentionally loose fit through body. If you are in-between sizes, we recommend sizing down. With the Charles I set out to create a truly versatile jacket. It's the perfect layering piece that is as comfy as a sweater with the construction of a blazer. Features: Hem angled down towards front. No shoulder pads. Single button closure. Pockets.